We’ve always been fans of the Volkswagen Touareg, and yet it’s the Porsche Cayenne that’s received a majority of the attention over the years. Both were launched in 2002, but the Cayenne has that Porsche badge, which means a lot. However, the Touareg has proven to be a formidable mid-size SUV. In fact, a highly modified version won the prestigious Dakar Rally in 2009. That said, the Touareg trucks on for the 2017 model year, but we’re honestly unsure about its long-term future. How come? The all-new, three-row VW Atlas crossover. But still, there’s a lot to like about the Touareg, starting with its design inside and out. Considering the styling dates back to 2010, we have to say things have aged very nicely. Our mid-level Wolfsburg edition adds 20-inch wheels and a two-tone grey and black leather interior. The dash design is also simple and straight-forward, but we were, however, not impressed with the dated infotainment system. Power comes courtesy of a 3.6-liter V6 with 280 hp and 266 lb-ft of torque. The diesel option, it should go without saying, is a goner. Our Touareg does offer a class-leading 7,716 pound towing capacity. As premium as the Touareg may be, it’s simply fallen behind the competition. But perhaps our biggest grievance here is just how expensive VW has priced this thing. For example, base price is $50,000 while the new Atlas will begin at around $30,000. 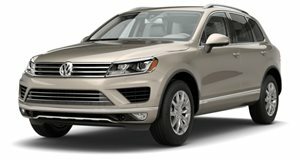 It’s just hard to justify buying a Touareg considering all of these factors, despite the fact we think it’s not at all bad SUV. Special thanks to DGDG.com for letting us film the car.